“PEI needs to have re-usable, recyclable, regenerating energy, like solar, wind, bio-mass, wave. Government needs to support shift to solar and wind power, and invest in renewable energy. Ideally all energy used would be generated on PEI – reduce reliance on electricity from mainland (New Brunswick, Quebec). Get power utilities (e.g. Maritime Electric, NB Power) to buy back power from individual wind and solar power generators. We already have enough wind turbines on PEI to supply almost all the energy needs of the province when they are running at peak capacity – i.e. 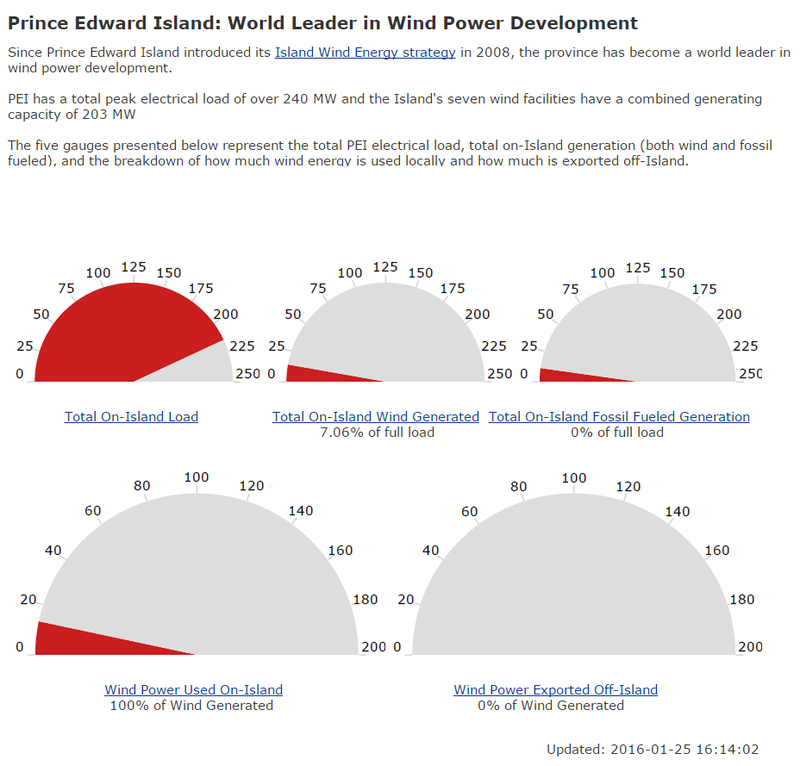 when the wind is blowing (see this link for an almost real-time break-down of PEI’s energy sources). There are times when more than 95% of PEI’s power usage is supplied by our wind turbines! However, much of the time our power is supplied from New Brunswick, like in the image below from 4:14pm on January 25, 2016. The problem is that we need to store the power created when the wind is blowing so it can be used when the wind isn’t. The same is true for solar energy – solar panels only produce power when the sun is shining, and it needs to be stored for use at night. Power storage solutions are just becoming feasible from a cost perspective. These include battery storage (e.g. lithium-ion, liquid metal, etc. ), pumping water to a higher elevation to be used for hydro electricity, and spinning up flywheels to store the energy. Why Tesla’s “Powerwall” Battery is Amazing: Tesla CEO Elon Musk introduced the world to the “Powerwall,” a wall-mounted battery for your house which aims to accelerate our transition to clean solar and wind-power. The product marks a really important moment in humanity’s battle to lower the CO2 emissions that are causing runaway climate change. Energy 2064 with Professor Donald R. Sadoway (MIT Professor) – how energy storage – i.e. a battery – is needed to harness wind and solar energy. He invented the “liquid metal” battery – 304 year life; built where used; enables distributed energy creation / storage. Carbon-free electricity plus dirt used to make steel. Aquion Energy manufactures clean and sustainable saltwater batteries that outlive and outperform traditional battery chemistries. This includes bulk energy storage for large-scale applications like PEI wind turbines. Energy is an annual 7 to 8 trillion dollar business and one of the major underlying cost of living drivers is the cost of energy. I have been called crazy for the last decade or two for postulating that with the advent of low cost renewables, electric cars and eventually low cost energy storage, that most of those trillions will stay in the pockets of billions of people, thus increasing wealth and the velocity of money in the economic system and unlike the fairy tale of “trickle down economics”, it will work, because the real job creators are the vast middle class and poor not the wealthy. Sound crazy right, well in the last year, two of the largest banking and consulting groups in the world, Citigroup and UBS, have published a study which more or less arrives at the same conclusion I did, they propose a starting crossover point at about 2020. In effect their analysis concludes that centrally generated electricity will become a technical dinosaur. There will be other benefits of which have not been discussed much, namely national security, currently the national electrical grid is be vulnerable to sabotage of a few critical nodes, however with millions of household and business generating their own energy with storage sabotage would be well neigh impossible. If you are in the fossil fuel business when low cost energy storage comes to market, be afraid, be very afraid.